AI will change the interaction between doctors and patients. But most patients won’t even know it’s there. That’s because improving the patient experience, provider productivity, diagnostic accuracy and overall quality of care won’t happen overnight or as part of some massive disruption. 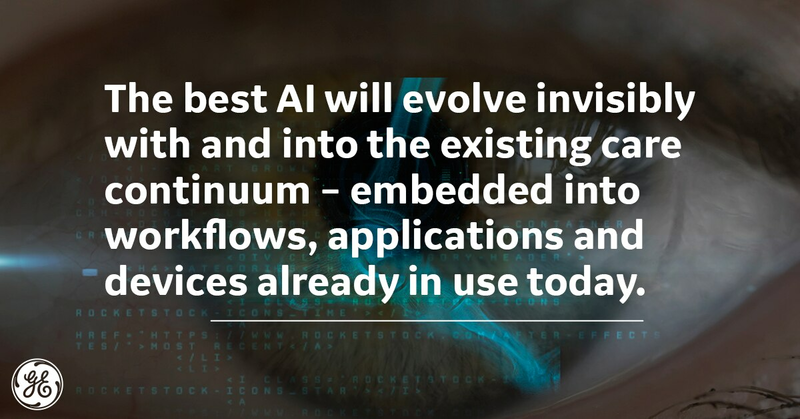 The best artificial intelligence (AI) will evolve invisibly with and into the existing care continuum – embedded into workflows, applications and devices already in use today. Today, hospitals store hundreds of millions of digital images, their numbers growing as imaging scanners such as MRIs and CTs become better at capturing thinner and thinner slices of the body – and 3D and 4D images become the norm. There is simply no way humans can turn that much data into useful information. Hospitals are producing 50 petabytes of data per year. A staggering 90 percent of all healthcare data comes from medical imaging. It’s a lot of information, and more than 97 percent of it goes unanalyzed or unused. AI is vital to tackling this “deluge of data” challenge in healthcare – and medical imaging is a logical place for AI to prove its worth. To do so, man and machine must work together, and radiologists need to appreciate that their roles will transform. By embracing the machine as an integral part of the care team, enabling it to automate routine procedures and processes, clinicians can focus on the most complex and critically ill patients and more efficiently and effectively diagnose and treat disease. AI-powered medical imaging systems can produce scans that help radiologists identify patterns – and help them treat patients with emergent or serious conditions more quickly. The goal: more accurate, quality care. Healthcare providers, equipment manufacturers and imaging technology vendors all have an important role to play in the adoption and evolution of AI in healthcare. For providers specifically, it is key they ensure the tools address the most impactful patient cases or workflow inefficiencies and that they help validate the algorithms in a clinical environment so seamless integration is possible. Modernizing enterprise imaging can help to improve the overall flow of information in today’s complex healthcare networks. It can also help to establish the consolidated data foundation needed for the efficient use of emerging AI solutions and other data analytics tools. 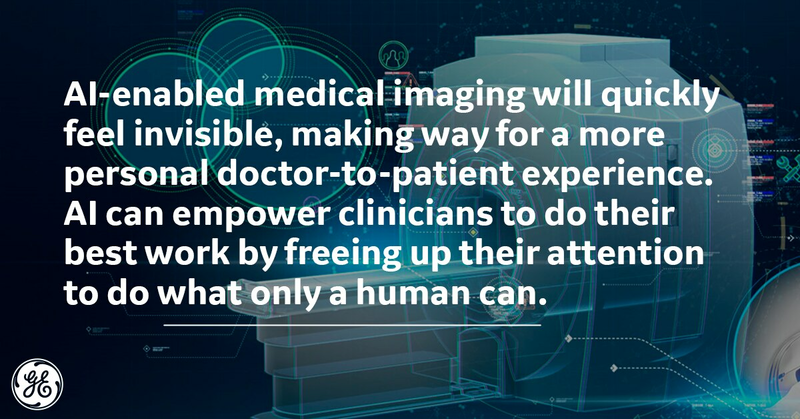 That’s why GE Healthcare and Intel have partnered to design the next generation of imaging technology. At a first-of-its-kind digital development lab for healthcare imaging technology, Intel and GE Healthcare coders are developing, testing and validating new innovations across medical imaging hardware, software, cloud and edge technology using the new Intel Xeon Scalable platform. The goal is to create solutions that will offer greater hospital efficiency through increased asset performance, reduced patient risk and dosage exposure – with faster image processing – and expedited time to diagnosis and treatment. Specifically, Intel and GE aim to enable radiologists to read images more quickly and to lower the total cost of ownership for imaging devices by up to 25 percent. In addition to looking at ways to best leverage the big data information from medical images, GE Healthcare is also turning to small data – a data source accessible on a local or department level – to gain valuable, real-time insights into employee practices and patient care to address workflow pain points. Healthcare’s oldest form of medical imaging, X-ray scans, account for three-fifths of all medical imaging, but X-ray “reject rates,” the number of images that cannot be used due to poor image quality or patient positioning, can approach 25 percent. Reducing these reject rates could save time and resources, improving the patient experience. That’s why GE Healthcare developed an X-ray analytics application that helps clinicians automate their data collection to understand the root causes of rejected images. Piloted at the University of Washington, the application has saved their radiology department measurable time and resources (up to 230 mouse clicks and seven hours of time) and has provided technologists with readily available feedback to help them work more efficiently. This work will eventually help radiologists and technologists get the right image on the first try – improving department productivity and freeing up more time for clinical interpretation and patient interaction. Leveraging small data for specific purposes can produce big wins that move organizations along in affecting change. AI is not a “one size fits all” solution. 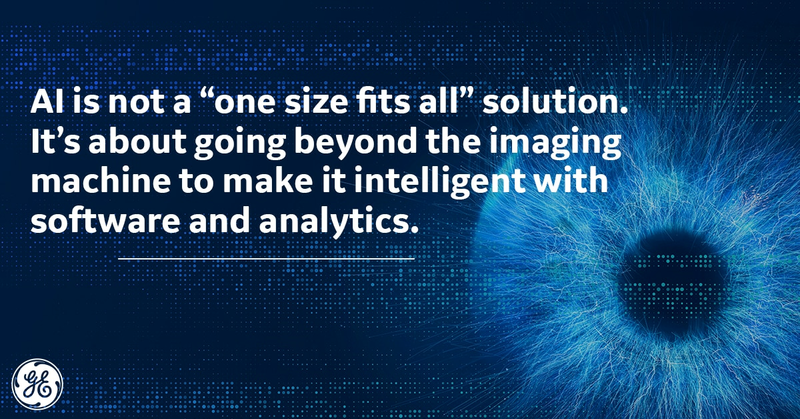 It’s about going beyond the imaging machine to make it intelligent with software and analytics. AI partnerships and advanced analytics teams have made significant progress over the past few years, but the work and outcomes are just getting started. These AI-enabled tools will quickly feel invisible, making way for a more personal doctor-to-patient experience. AI can empower clinicians to do their best work by freeing up their attention to do what only a human can. To learn more about how GE Healthcare is working to create intelligent devices, register for the “beyond imaging” workshop in a U.S. city near you this Fall. The results expressed in this document may not be applicable to a particular site or installation and individual results may vary. This document and its contents are provided to you for informational purposes only and do not constitute a representation, warranty or performance guarantee. GE disclaims liability for any loss, which may arise from reliance on or use of information, contained in this document.